How to translate Text to Different Languages in Microsoft Word 2013? This article will explain how to quickly translate text to different languages in Microsoft Word 2013. 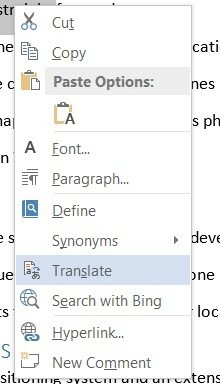 Microsoft Word 2013 has a feature that lets the users to easily translate the text or the document to different languages. Follow the below steps to translate text to different languages in Microsoft Word 2013. 1. Launch Microsoft Word 2013 and open the document that you wish to translate. 2. Select the text that needs to be translated and then right click to display the context menu and then click “Translate”. 3. This will display the Research Pane. Select the language to which the text should be translated to. The translated text will be shown in the same section. You can also select translate whole document from the research pane which translates the whole document.